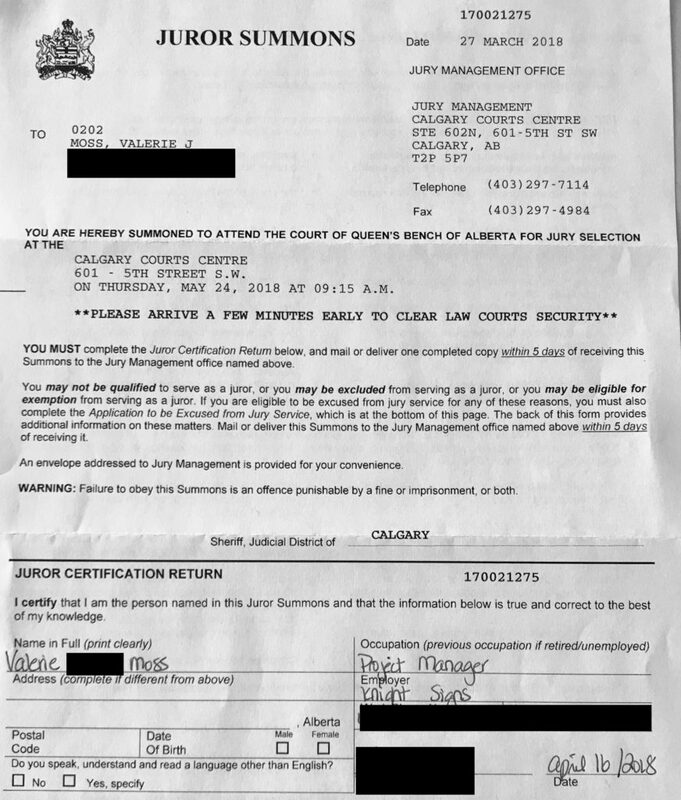 I picked up the mail like any other day and there’s a letter from the Alberta government…opening it initially thinking it was for a vehicle fine or something…to my surprise it was a Jury Duty Summons. A “jury summons” is a court order. It means you have to attend at the time and place stated so that a jury can be selected, unless you have been excused. 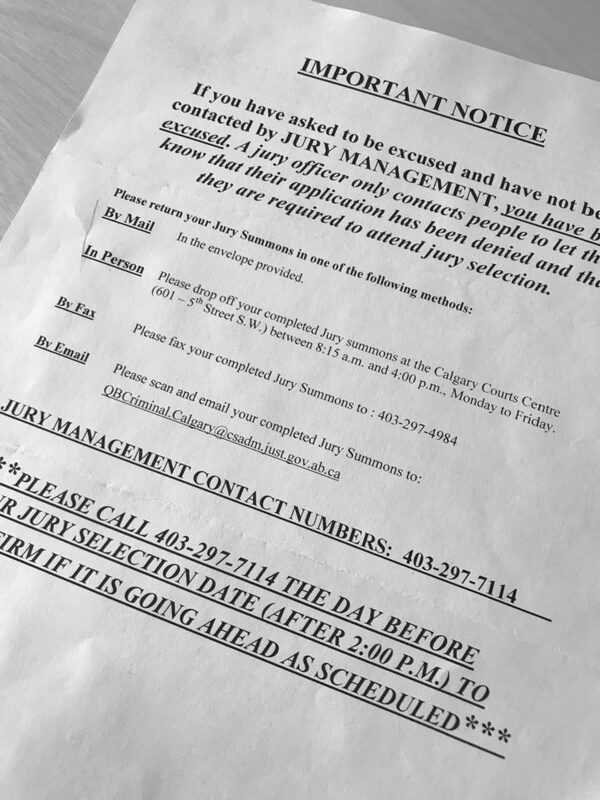 Although you may not be chosen as a juror, you do have to show up. Serving on a jury in our society is both a privilege and a legal duty. For as long as I can remember I’ve wanted to be on a jury, watching all of the crime shows and listening to the different cases on the news I wanted to be part of this experience. I hear lots of people do not want to be on jury duty nor are they honoured or thrilled to get this letter…but I am! I think it’s our civic duty to be part of this process. Our taxes and our Right to vote and have an impact. This kind of stuff makes me tic and want to be part of the society we live in. have an impact. The jurors are charged with the responsibility of deciding whether, on the facts of the case, a person is guilty or not guilty of the offence for which he or she has been charged. The jury must reach its verdict by considering only the evidence introduced in court and the directions of the judge. There’s a part of me that has a bit of a concern if I was to get a case like OJ Simpson or something like this that could financially impact my life long term and my family unit. 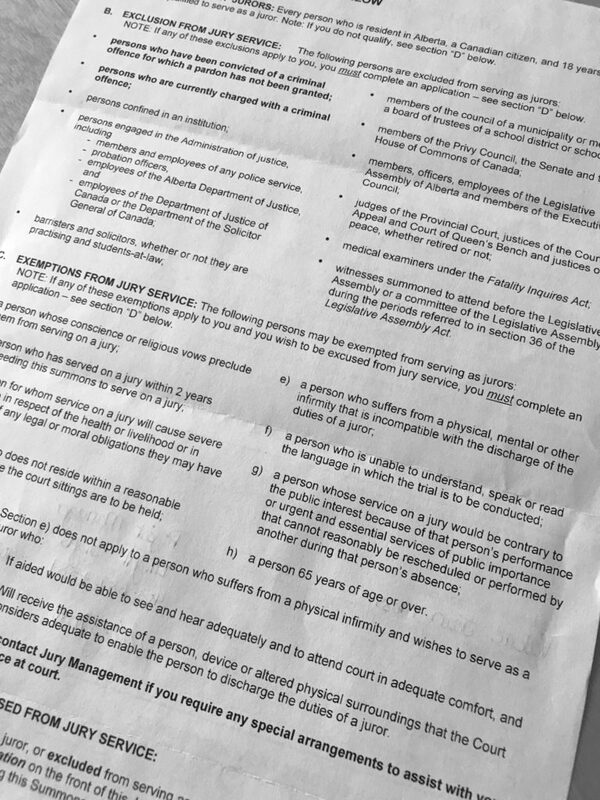 What about a case of child abuse or animal cruelty – how would I react…I’m prepared in some ways understanding this would be a serious offence and the people on trial may not be understood or understandable….wish me luck. Tell me your story and I’ll add it to a future episode. Send me an email and let me know what it was like or leave me a comment through your podcast app or in my show feed. Over 20 years ago my dad was on a jury, at the time I didn’t know although I was in school and living with him at my childhood home, he kept this a complete secret from me. He got up and went to “work” every day like normal, I had no idea until it was over. He had a very hard case to decide on the the victim in his case was a teenage girl and her name was Valerie.. couldn’t be closer to home for him. It was a tough case and has stayed with him for a number of years. It was about a bunch of teenagers driving around in a car drinking and having a good time, until they weren’t. There was a car accident, the one girl (Valerie) was struck by a tape deck and she bled to death – the biggest part of the story from my dad’s perspective was the driver was concerned about the stolen tape deck and not about this girl bleeding to death – such a bad decision for him. The poor girl died due to his lack of concern – again from my dad’s perspective. Thanks for Listening to the podcast and let me know what you think by leaving me a comment or rating on iTunes, stitcher, google play, blubrry and tuneIn radio or wherever you get your podcasts. The intro for today’s podcast is recorded by Janice Wilby who was featured in my Boadcasting for Corrections episode. The out-tro is recorded by London Moss. The podcast is produced by me Valerie Moss, through Garage Band and WordPress.